It’s been 4 weeks of peace signs. 28 days. Today I used cedar. Shocking I know. This is more left over 1/4″ toungue and groove closet liner. 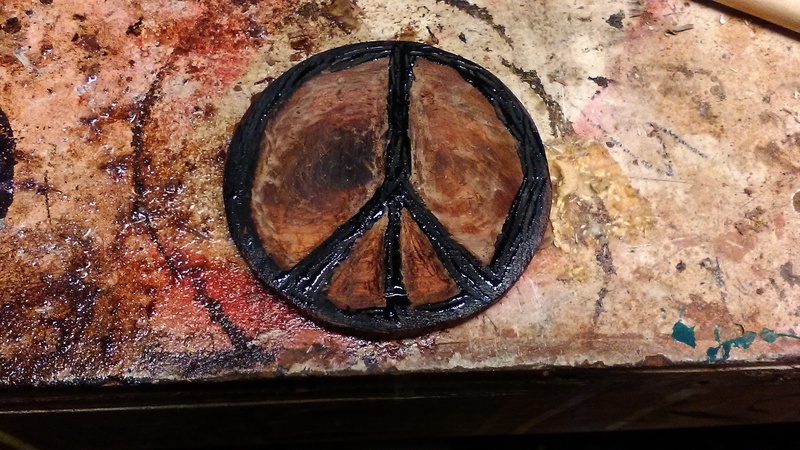 I drew on to the wood in pen, outlined the ink with a razor blade, and then chiseled out barely 1/32″ of material. I doused it in mineral spirits and set it on fire. (Outside with a fire extinguisher near by) I sanded it a bunch, cut the circle out with the scroll saw. Set it on fire again and painted the outline black. It’s been through a lot. It has knots, gashes, chips and scars. But it survives. Being peaceful sometimes means absorbing violence without reflecting it back. That can do damage. But it can also build strength. 28 down 337 more to go. 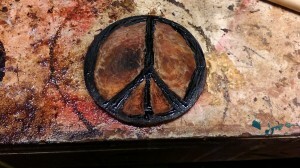 This entry was posted in 365 days of peace, on-going projects, repurposeing, scrap wood by brighid. Bookmark the permalink.